Life is hectic. Moms, dads, kids — all of us — are running at breakneck speed. We need to find ways to be renewed—as individuals, as families and in our communities. Sara Schley, who runs at her own breakneck speed as wife and mother of twins while leading a successful company consulting to businesses on sustainability, has found soul-saving-sanity and renewal through her family’s observance of the Jewish Sabbath (Shabbat). 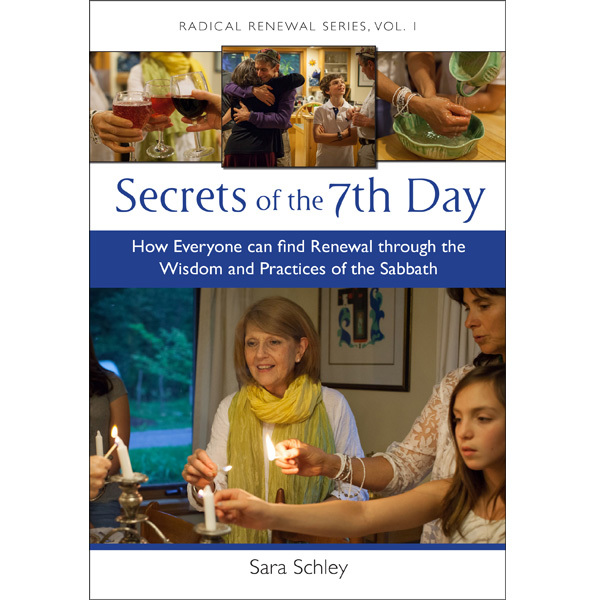 Inspired by a non-Jewish friend who said, “Sara there is no center in our lives, you have to teach us how to do Shabbat!”, Sara has written Secrets of the 7th Day, the first book of her Radical Renewal series, about how everyone can learn from this ancient Jewish ritual, whether or not they are Jews or even religious. The practice of unplugging from the world, slowing down, sharing in the simple joys of food, stories, songs and the outdoors can be celebrated by all. Ancient as the Sabbath is, we need it now more than ever.